Acer tries to do Lenovo’s Yoga-series laptops one better with its Switch 10: This 2-in-1 can fold into tent, presentation and tablet modes just like those famous convertibles. 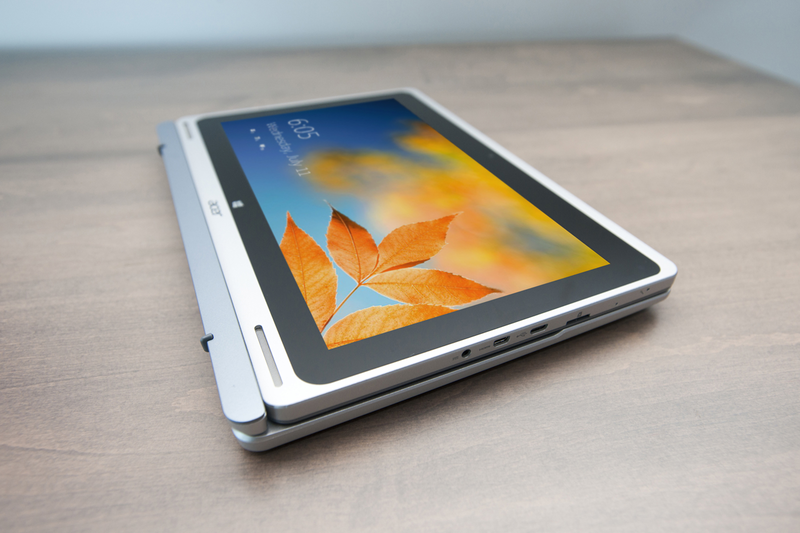 But Acer’s 10-inch display can be completely detached from its keyboard dock to transform it into a true tablet. There’s no need to fumble with a release mechanism, either. Friction catches and strong magnets hold the two components together, but the magnets are almost too powerful. They’re supposed to help guide a pair of sockets on the tablet to posts on the keyboard, but I found myself constantly needing to reseat the tablet, because the magnets seized the dock before I had an opportunity to line them up properly. The Acer Switch 10's display can be detached from its keyboard dock to become a true Windows tablet. To separate the two, hold the keyboard down and give the display a strong tug. The friction catches inside the tablet sometimes take a few seconds to retract, with a disconcerting sound that had me wondering if something had come loose inside the first few times I heard it. With devices that have 360-degree hinges, presentation mode leaves the keyboard facing down against your work surface, while putting it in tablet mode leaves the keyboard facing out and against your hand. Reversing the Switch 10’s display leaves the keyboard facing up behind it in presentation mode, and flat against the back of the display in tablet mode. Tent mode is also available for those times when your work surface is limited—such as an airline tray table. Tent mode makes it easy to watch movies in cramped spaces, such as an airline seat. This clever design is somewhat undermined by a less-than-awesome display. I suppose a 10.1-inch, 1366x768 display is to be expected at the lower end of the tablet price range, but Acer’s panel doesn't get particularly bright. It's the only tablet I've used where I felt the need to keep the brightness cranked at all times. The tablet looks bulkier than its 0.35-inch thickness and 1.29-pound weight due to its wide, black bezel, with an outer silver frame. Front-firing speakers at the bottom (in notebook or presentation mode) or top (in tent mode) get impressively loud. Presentation mode is just the ticket for PowerPoint slideshows. The keyboard’s keys are small, flat, and surprisingly stiff. My first keystroke failed to register until I became accustomed to its tactile response and learned how hard I needed to strike the keys. The dock is also on the light side for how heavy the tablet is. It tends to slide around the desk when you tap its display in notebook mode. Unlike laptops with 360-degree hinges, you won't feel the keys when you put the Aspire Switch 10 in tablet mode. The only ports on the tablet are micro and mini versions of USB and HDMI, respectively. The tablet also supports Miracast wireless video streaming if you don't want to mess with an HDMI adapter to connect the tablet to a stand-alone display. Bluetooth and 802.11 a/b/g/n Wi-Fi round out its wireless connectivity. The included keyboard dock has a full-size USB 2.0 port, but no USB 3.0. The rest of the Switch 10’s specs are standard for the lower end of the tablet range. 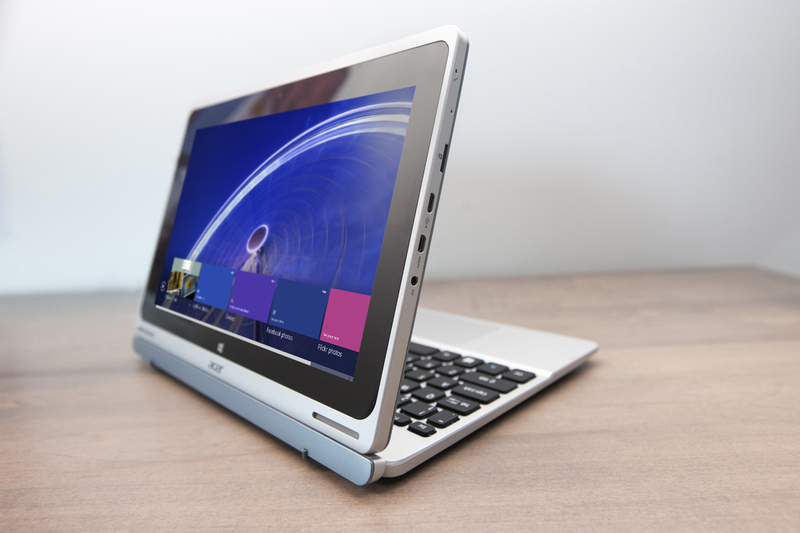 Acer picked an Intel Atom Z3745 (Bay Trail-class) CPU and paired it with 2GB of DDR3/1066 memory. A 64GB eMMC drive is provided for storage, which can be supplemented by a MicroSD card. Acer also offers a less-expensive model with only 32GB of storage, but that's really pushing it for a machine running Windows 8.1. 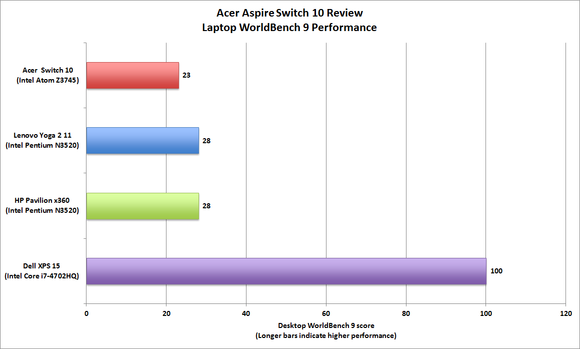 The Acer Aspire Switch 10 isn't as powerful as the Lenovo Yoga 2 11 or the HP Pavilion x360. With standard specs comes average performance. The tablet is perfectly acceptable in day-to-day usage, but my usage is not particularly demanding: Email, web browsing, YouTube and Netflix, and Office tasks all worked smoothly. The Switch 10 outperformed the Lenovo Yoga 2 11 and the HP Pavilion x360 on the PCMark 8: Office benchmark by virtue of its flash storage, not because it’s inherently more powerful. Both of those machines have mechanical hard drives, but faster CPUs, so both of them earned a higher Laptop WorldBench scores. 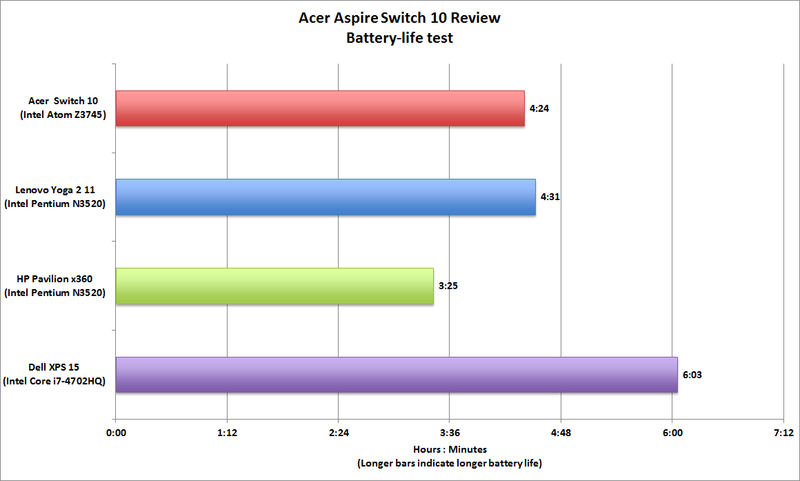 And that makes it doubly disappointing that the Acer’s battery died seven minutes sooner than the Lenovo’s did (the Pavilion x360’s less-than-3.5 hours of battery life, for what it’s worth, is just atrocious). 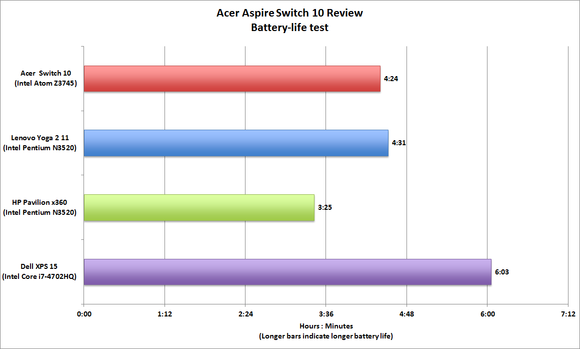 The Aspire Switch 10 should have better battery life since it doesn't need to spin the platters on a mechanical hard drive like the HP and Lenovo machines. Buy one, or keep shopping? 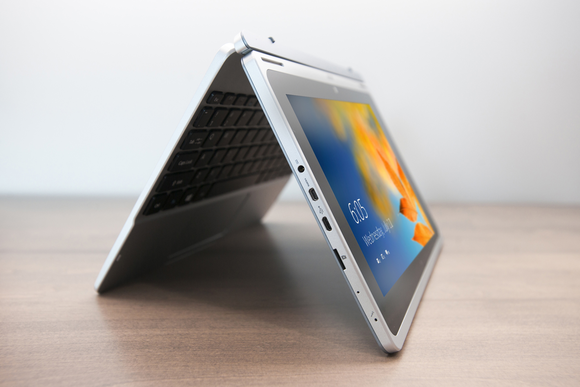 If a 2-in-1 with a detachable display is what you crave, I’d suggest taking a look at the Asus Transformer Book T100. It’s a little thicker, but it weighs about the same. More importantly, it has a better keyboard, and the 64GB model is street-priced the same as the 32GB model of the Acer Switch 10. The 64GB version of the Switch 10 reviewed here costs $80 more. 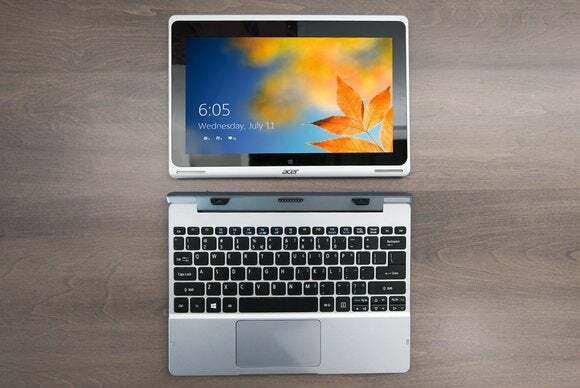 The Acer Aspire Switch 10 is a novel take on the 2-in-1 notebook/tablet hybrid, but both the tablet and the keyboard halves of the equation are mediocre, and the tablet's battery life is too short.